Just comment with your name and email address. Note: Step 2 and 3 are optional. Just leave a comment with valid name and email address and I will send you an invitation :). To get an invitation don’t forget to add me as a friend on orkut so that I can invite you for the new design as orkut allows to invite the users in friend list only. After adding send me a scrap. Most of the users are commenting here to get invitation without adding me on orkut. Please make sure to add me before you can get the invitation as orkut allows to send invitations to friends only. .-= S.Pradeep Kumar´s last blog ..Grab 7 Free Orkut New Design Invitations : Giveaway =-. Give me your email ID and add me on orkut first so that I can send you an invite. .-= Shafar´s last blog ..Win a New 32GB iPod Touch from GadgetLite! =-. Hi please send me invitation…………. hey you started giving away the invitations…. cheers.. This is a nice thing to do. I see more and more bloggers are giving invitations out for programs. I’m curious to know if your total number of subscribers has had a dramatic increase? .-= George Serradinho´s last blog ..Thesis Tutorial â€“ Displaying Users Twitter link in the Comments Section =-. .-= adone´s last blog ..Kilka sÅ‚Ã³w od FAMA FAMILIA =-. .-= Dan*´s last blog ..9 Best Free Alternatives to Paid Commercial Software =-. I love Orkut, really want one! please send me a invitation for the new orkut. love those people who created the new orkut. If I am not in your orkut friend list then please add me as your friend so that I can send you an invitation. I am waiting for new orkut invitation from you. Thanks dude. 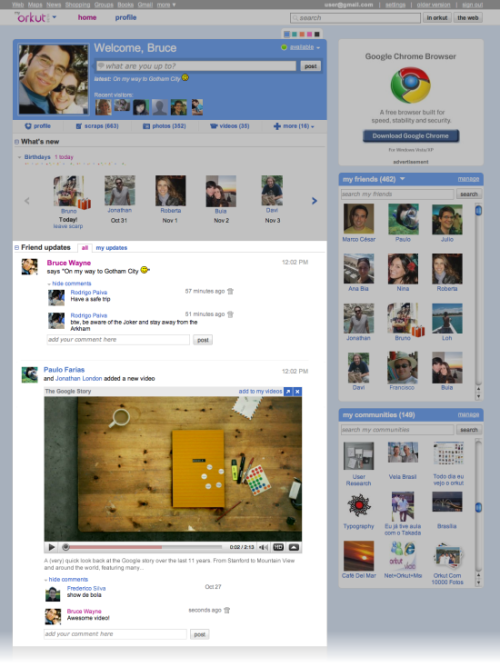 New orkut theme rocks. .-= Rahul´s last blog ..Virtual Keyboard For Firefox Browser =-. plzz send me the invitation for new orkut…. .-= Gagan´s last blog ..BeepTheGeek : Clothes Changed =-. Hi dear plz send me the new orkut version…. .-= Gagan´s last blog ..How To Close Your Google Account =-. Hi, I live in Brazil, would like to earn an invitation. could you please send me an invite? please add me.i’ve been waiting for more than a week now.. But i like the old version. .-= Anish KS´s last blog ..AAHAT â€“ All New Series On 20th Nov At 11:00 P.M on Sony =-. .-= Dan*´s last blog ..A Kid From Foreign Country =-.